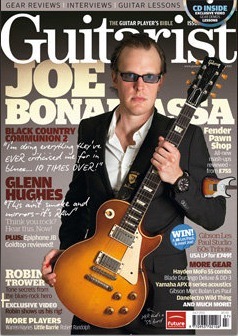 Joe Bonamassa is featured on the cover of the July 2011 issue of Guitarist Magazine. The magazine is one of the largest, if not the largest guitar magazine in Europe. The magazine should be hitting new stands in the US as well, within in the next week. Both Borders and Barnes and Noble carry the magazine. We talk to the world’s hottest guitarist and the legendary voice of rock about the second coming of their phenomenal supergroup Black Country Communion. The issue features both information on Joe’s solo career and Black Country Communion. These magazine are of high quality and the glossy covers always look nice with a signature. Make sure you pick up your copy.. Read more on Guitarist’s website.